To promote the 1954 movie Underwater, Howard Hughes flew 200 journalists and movie stars to a Florida lake, then gave the journalists scuba gear so they could watch the movie 25 feet below the lake's surface. I just received an email with some glamorous memories. Jayne Mansfield was there in a bathing suit, and "When she went into the water...it became translucent!" 55 years later, William Ray (the PR director) wanted to reminisce -- and to tell me the complicated arrangement he'd worked out with RKO pictures. The projector was mounted in a boat with an underwater room and a large plate glass window on the side (underwater). Underwater speakers were used to project the sound through the water. The event had to occur at night in order to have the ability to project a visible image. "We had a screen made and mounted on a steel pipe frame. It was placed underwater at a depth of about 10 feet... The water was crystal clear and the projector easily displayed the images on the screen. We supplied the weighted chairs and the aqua lungs for the guests...in water which was about six to eight feet deep. The media coverage was huge. I received over 700 clippings from one clipping service in one day. There were lots of stars and starlets on hand. And of course, Jayne Mansfield's bathing suit proved "very interesting to all the photographers." Ray remembers that she got a big movie contract after flying back to Hollywood — but not from Howard Hughes. According to the book "Howard Hughes: The Untold Story," there was only one problem with the underwater screening. "Several journalists kept bobbing to the surface!" "Hughes loved it," a publicist remembers in the book. But Jane Russell, the movie's star, has a different memory. 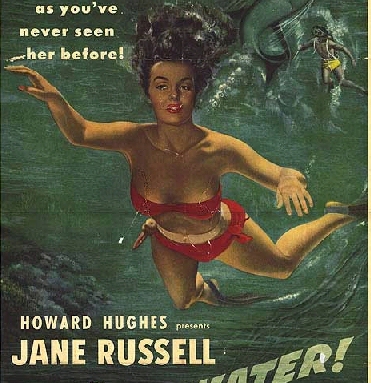 One blogger even points out that that's not even Jane Russell's body on the poster. The poster's artists just swiped the body from the August 1954 issue of Collier's magazine!